Questions on optics were discussed on earlier occasions on this site. You can access those questions by clicking on the label ‘optics’ below this post. Generally simple questions will be asked from this section. But to answer them correctly you need to have a thorough knowledge of basic things in this section. Even a small portion of the lens can produce the full image of the object. But the brightness (intensity) of the image will be reduced since half the aperture of the lens admits light. The correct option is (d). 1/f = [(n’/n) – 1] (1/R1 – 1/R2) where ‘f’ is the focal length of the lens, n’ is the refractive index of the material of the lens, n is the refractive index of the medium in which the lens is placed and R1 and R2 are the radii of curvature of its surfaces. The quantity (1/R1 – 1/R2) is positive in the case of a lens that is converging in air. The ratio n’/n has to be greater than 1 for the focal length to be positive (and hence the lens to be converging) when the lens is placed in any other medium. [A simple ray diagram will lead to the answer to the above question. The adjoining figure shows the manner in which a lens which is converging in air becomes diverging in a medium of refractive index greater than that of the lens. 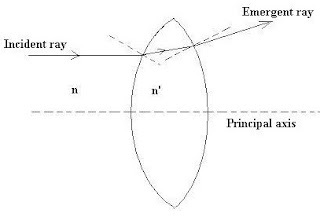 At the first surface of the lens, the ray is refracted away from the normal where as at the second surface the ray is refracted towards the normal. The net effect is to bend the ray further away from the principal axis of the lens]. (3) A thin monochromatic beam of light proceeding through glass is incident at an angle i at glass-air interface. 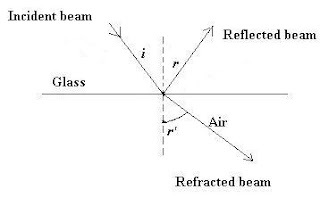 The beam is partially reflected and partially refracted at the interface such that the angle between the reflected and refracted beams is 90º, as shown in the figure. If the angles of reflection and refraction are r and r’ respectively, what is the critical angle for the glass-air interface?. (4) A transparent slab with parallel faces has its refractive index increasing linearly with distance from end A to end B (Fig.). Parallel rays of light are incident normally on this slab as shown. What will happen to these rays? (Ignore reflection at the face of the slab). (e) They will proceed undeviated. Since the angle of incidence is zero (normal incidence), the angle of refraction also is zero irrespective of the refractive index. Therefore the rays will proceed undeviated. (5) The figure shows five lenses a, b, c, d, and e made of glass. When placed in air which lens/lenses will act as converging lens/lenses? Lens (d) is a planoconvex lens and is converging. Lens (c) has one surface convex and the other concave. But the convex surface has smaller radius of curvature. Therefore, the divergence produced because of the concave surface is more than compensated by the convergence produced by the convex surface. It can therefore function as a converging lens. Lens (a) also has convex and concave faces. But the radius of curvature of the concave face is smaller so that the convergence produced by the convex face is more than compensated by the divergence produced by the concave face. It will act as a diverging lens. Lenses (b) and (e) are evidently diverging lenses. So (c) and (d) are the converging lenses [Option (e)].